Here's where you'll find the latest workout to help you burn fat and build a lean, healthy body. Who are these workouts for? They're for you. Young or old. Whatever shape you're in. Don't make the mistake of thinking they are either too hard, or too easy for that matter. Do they look too easy? There are variations to increase the intensity. Too hard? That's simple. Just use lighter weights. Or no weights at all. Can't run? Then walk. There is one workout detailed on this page. It will tell you what you need to know and to do. Then at the bottom of the page there are some links that go to other workouts. Try one or all of them. It's easy to get stuck doing the same thing over and over. When you vary things you'll improve your results. This is a simple, straightforward, extreme-fat-burning workout. It's an overall body workout that builds endurance. It can help break you free from a plateau. It's a full body workout. Your entire workout -- one hour -- is one exercise. 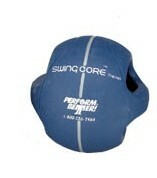 Hold a core ball (something similar to the one in the picture) or a dumbbell in both hands. First squat down, keeping back straight, touch ball on ground between legs. Then stand, raising ball above head, and extend arms. That's it -- touch the ball on the ground, then raise it overhead. Use lighter weight or no weight at all. Instead of touching the floor reach halfway to floor. Cut down number of repetitions. Do ten repetitions and then rest for 15 seconds. Step up on a platform while raising ball overhead. Raise up on platform using one leg only. Raise up on toes as you reach overhead. Raise ball overhead using only one arm. Alternate side lunges, lunge left and touch ball on floor -- raise ball overhead -- then lunge right. Use two weights -- one in each hand. Why 375 repetitions? That's easy. That's how many I can do in one hour when I do this workout. You might do more or less. If you do more, shoot for 500 reps. That's a nice round number. If you do less, don't even think about less than 100. You are trying to show your body that it can do more than it thinks it can. And if you can do 25, or 50, then you can do 100. Try it. You'll see. If it seems too hard, just slow the pace a little. When they were laying railroad tracks by hand the new guy would drive spikes at a furious pace -- until a few minutes later he collapsed in a heap. The old timers paced themselves. So pace yourself and have fun with this workout! A lot of our readers have contributed their own favorite workouts. You can read about their best workouts at this link.